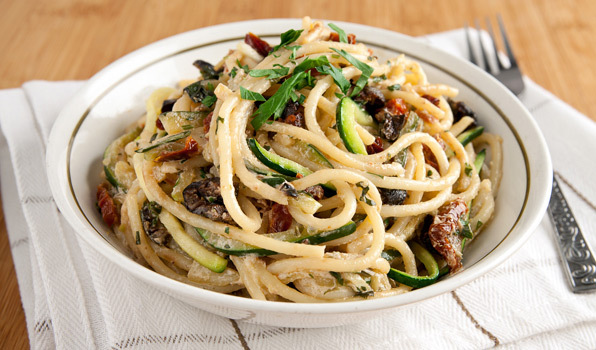 Made with sundried tomatoes, zucchini and black olives, this pasta has a secret ingredient that makes it both creamy and light. Bring large pot of water to a boil. Generously salt. Cook the spaghetti until al dente. In a large heavy skillet, heat the olive oil and sauté garlic for 2 minutes. Add the zucchini, sundried tomatoes and black olives, and cook for 4 to 5 minutes. Keep warm. In a large bowl, combine the yogurt with basil, marjoram and parsley. Add drained pasta, zucchini mixture, Parmesan cheese, and salt and pepper. Toss to combine. Serve. That’s a great idea using yoghurt. I hate eating it raw by itself, but it is great for marinades and many sauces. I never thought of using it with pasta before!